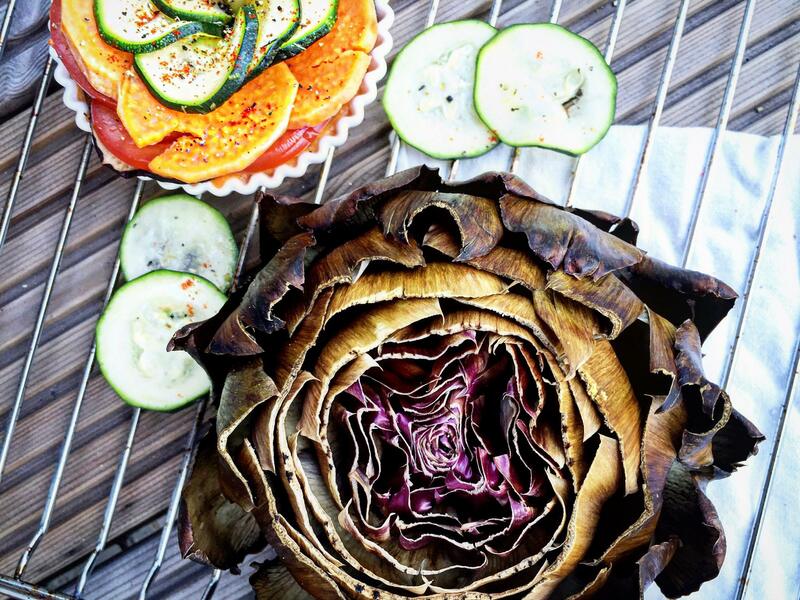 Due to popular demand I decided to post my recipe of how I roasted this artichoke to get this yummy gorgeous goodness. 1. Firstly cut off the stem plus about a centimeter of the bottom of the artichoke, so that it can stand on its own. Ensure to take a big and sharp knife for this as the raw artichoke can be quite tough to cut. 4. Roll out enough kitchen foil to cover the entire artichoke and drizzle 1-2 tbsp of olive oil into the middle. 5. Take the artichoke and roll it in the olive oil so that it gets covered on the outside. 6. Peel the garlic clove and cut in half. Push apart the middle of the artichoke with your fingers and drop the garlic clove in there. This with give you artichoke a great aroma. 7. Place the artichoke in the middle of the kitchen foil and cover it completely. 8. Place it a pre-heated oven at 180 degrees for at least an hour. Don’t forget to remove the garlic again once done – this is edible and very tasty as well after all this time in the oven. Now, how to eat an artichoke? The outside leaves are not fully edible, but pull all leaves out. The lower part of the leaves is very soft and tasty. Scrape it off with your teeth and get rid of the rest of the leaf. Once all leaves are gone, you get to the middle part which has some kind of ‘hair’ on it – I would not recommend eating the ‘hair’, but underneath is the very tasty heart of the artichoke. Take off all ‘hair’ and enjoy the middle piece! Hope this helped anyone who ever wanted to try roasting an artichoke. Its absolutely tasty and I can only recommend trying it out! Which of my Instagram recipes would you guys like to read next?